Canadian dressage athletes topped the leaderboard in Saugerties, NY at the CDI3*/1*/J/Y/P presented by HITS on the Hudson held at the HITS Show grounds, August 15-18. 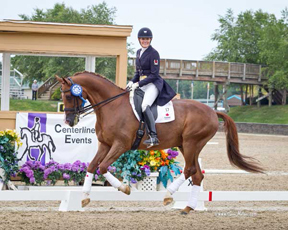 Four-time Olympian and Toronto Native Ashley Holzer, currently residing in New York, USA took first place in both the FEI CDI Grand Prix and FEI CDI Grand Prix Special aboard Eliane Cordia-Van Reesema’s Jewel’s Adelante, a 13-year-Old Swedish Warmblood gelding, sired by Don Schufro. The pair earned a final score of 68.936% for their efforts in the Grand Prix test and 71.021% in the Grand Prix Special. Reserve rider for the 2012 London Olympic Games Diane Creech of Caistor Centre, ON and Devon L, Doug Leatherdale / Leatherdale Farm’s 13-year-old Hannoverian gelding sired by De Niro, took second place behind Holzer, scoring 68.681% in their Grand Prix test and 70.563% in the Special, while two-time Olympian Jacqueline Brooks of Cedar Valley, ON rode D Niro, Brookhaven Inc’s 14-year-old Swedish Warmblood gelding sired by D-Day, to third in the Grand Prix on a final score of 68.532%. David Marcus of Campbellville, ON rode his 2012 Olympic partner, Chrevi’s Capital, Deborah Kinzinger Miculinic’s 13-year-old Danish Warmblood gelding sired by Chrevi’s Lavallo to third place in the Grand Prix Special on a final score of 69.854%. Brooks and D Niro went on to take first place in the CDI Grand Prix Freestyle earning a final score of 71.550%. Marcus rode, Don Kontes, Deborah Kinzinger Miculinic’s 13-year-old Swedish Warmblood gelding, sired by Don Schufro, to a second place finish in the Freestyle with a final score of 69.450%. In the Prix St. Georges, Brittany Fraser of New Glasgow, NS and her mount, All In, an eight-year-old Dutch Warmblood gelding sired by Tango, won first place on a final score of 73.509%. Fellow Canadians Shannon Deuck, a British Columbia native currently riding out of Loxahatchee, FL rode Cantaris, a 10-year-old Hanoverian gelding sired by Compliment, owned by Elizabeth Ferber, to fourth place finish with a score of 68.026% and Maya Markowski of St. Clements, ON guided Lumiere, her 10-year-old Canadian Warmblood sired by Lynx, to fifth place with 67.281%. Fraser and All In earned 72.632% in the Intermediaire 1 for anther first place finish and Markowski took second place on Lumiere with 69.386%. Diane Creech took third aboard Hallmark, Doug Leatherdale / Leatherdale Farm’s eight-year-old Hanoverian gelding sired by His Highness, on their final score of 68.553%. In the Young Rider division it was a triple play for Tanya Strasser Shostak of Ste Adele, QC, who rode Evi Strasser’s Action Tyme, a 13-year-old Oldenburg gelding sired by Aktuell, to earn top scores in all their divisional tests. The pair produced a final score of 65.702% for the win in Y/R Team, and then 66.974% in the Y/R Individual test, closing out the event with their third, first place finish, on final score of 69.417% in the CDI Freestyle. CDI Ground Jury for the event consisted of; President Axel Steiner, USA, 5*, Maria Colliander, FIN, 4*, Marian Cunningham, PER, 4*, Jo Graham, GBR, 4*, and Elizabeth McMullen, CAN, 5*. For complete show results, click here.